Door Hardware Ordering and Shipping Info. 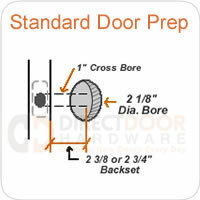 Why Buy From Direct Door Hardware? Free Keying on all the locks in your home (charges may apply for master keying developments). No sales tax outside of Utah. Knowledgable staff of real people that answer the phone and emails. We offer all the major brands. Get all your door hardware, bathroom accessories and miscellaneous home hardware in one place. Save tons of time and gas money tracking down everything you need locally. Celebrating 5 years as a leading online hardware store. Our products are shipped UPS Ground. Most orders leave the warehouse the same day or the next business day (depending on the time the order is received). Shipping time is about 5-10 business days, sometimes sooner - depending on your location. If you need 2nd day or overnight shipping options, please email us the items you will include in your order so that we can get a quote for the correct weight of your package. Novelty cabinet hardware and or address plaques are not always readily available and may take 2-3 weeks for delivery. To ensure your privacy while shopping on our website, we have set up our shopping cart with a secure encrypted connection. You can order your door hardware securely online with your credit card. This is the fastest way to get your order processed. We accept, Visa, Mastercard, American Express, and Discover. If you prefer not to pay online, we'd be happy to take your order over the phone. Just call us toll free at 307-886-9449. Please call 877-852-9449 for instructions. Orders paid by check or money order will not ship until receipt fo payment.